This is the other name for this Great Mountain. 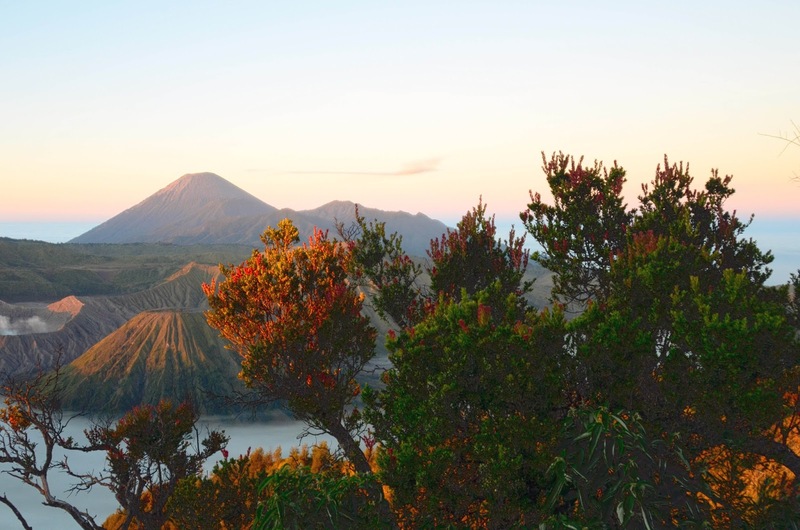 Located on the Java Island of Indonesia, it is also the highest strato-volcano on this island. 50 m shorter than Rinjani, but many times tougher to climb. Standing at 3,676 m, Semeru from a distance looks beautiful and majestic, and on close inspection, it looks even more imposing! We have climbed Gunung Rinjani on Lombok, and we thought "what is another volcano", we have the experience. We were totally wrong! Prior to the climb, somehow the authority requires climbers to get letter of "fitness" from doctor certifying that we are able to climb. So each of us having to cough up RP 35,000, we went to the clinic on the eve of Hari Raya Adilfitri, and we didn't get to see the doctor, but a nurse measured our Blood Pressure and Weight. Worse, the Blood Pressure was taken wrongly, and the weight was written down by us! Other than contributing RP 35,000, I still am clueless what does that "Letter of Fitness" bought us. After passing the lake, and meadering through the valley, we were presented with this magnificent view of Gunung Semeru. Observe the treeline, this will be about 3,200 m; and observe the light colour soil on the face of the volcano (somewhere in the centre), that will be the trail for ascend. We arrived in this village on the day of Hari Raya Adilfiltri, thus the many flags that are up, and much celebration going on. Also, the flag of Red and White symbolises the Indonesian state flag, and soon they will be celebrating their indenpendence day too. From Surabaya town it will take about 3 hours of driving to this outpost, also the beginning of the track to Gunung Semeru. The track from here to the campsite, will be about 16 km long, with ascent of about 200 m, that is to say, not much gradient. This is good, if you can consider that we need to warm up those climbing muscles! Along the way, we walked pass this river, with the local going about their daily chore. The hikers proceeded with their journey after registering for the climb, and with the "Letters of Fitness"
Rows and rows of vegetables. As always at this altitude, the deciduous pine reins supreme. At 2,400 m, there will always be the occasional mist. Along the path, I chanced upon this mouse - either it is so conditioned to human traffic, or I smelt like the jungle! After an hour plus of walking, Ranu Kumbolo is in sight. This is a big lake, which offers campers water and refuge! To the valley, we will need to descend via this eroded path. Only to see careless campers and hikers treating this lake as a convenient dump! We saw fishes thriving in this lake, and many lines and hooks attempting to catch the bigger ones. After the lake, and to the valley floor we will walk, and this time it will be towards the campsite. Tall grasses grow here, and once we walked into the bushes, we were basically dwarfed by these tall shrubs. In this tall bushes, birds make their home. Not too sure what species is this? Another sign - our first leg is coming to a close. Beautiful Semeru is now before us - and I wonder how are we going to make that climb! Awaken at 01:30 hr, and with a simple breadfast, we started our climb at 02:30 hr. We were told that it will take us about 1.5 hours to reach the treeline, and then another 1.5 hours to the summit, so that we can view the sun rise. We didn't realise that we have passed the treeline - after all it was so dark, but then on this slope, the sun is about to rise. 3 hours from campsite to summit, this timing must be for the super fit. At higher ISO, and you can see the struggle just to climb. here, a fellow trekker with the aid of the local, was being helped along. There will be many pit stops for it was a grueling climb. Imagine if you have to walk on the sand, and your feet cannot find any good grip for traction, compound this with a steep gradient, and you can imagine that for every 3 steps up, you may end up with 2 steps down. And many of us, have got stuck in places that we just simply cannot move up. Oh well, might as well appreciate the beautiful sunrise since we are stuck! Finally, oh finally - at 09:00 hr, the last 2 climbers were up. Of the 15 of us that set forth, 1 fell sick, and stayed in the camp, and 3 got stuck going up, and thus there were 11. 11 happy souls felt so triumph for managing to reach the summit, and on this day "Singapore National Day 2013" What do you do when you have reached after an arduous climb, and moreover it was Singapore National Day - that is right, we recite the pledge. Reminder of how, tiny Singapore struggled to become a First Class Country from independence in 1959 and separation in 1965. A view from the top before we start our descend. Preparation for a tough journey down - tough as our muscles are now so spent, from the ascend. Soil is loose, and slope is steep, but hey it beats climbing up! Along the way, we picked up one of our stragglers, a pity for he was just a mere 30 m to the summit! See the soil, loose like sand. Downward journey - it was like snow skiing - except this was sand. Now that we can see better in daylight, we wonder how we managed to climb to the summit in the night. Amazing! After our lunch, we started our journey back to the village. A backward look to the mountain, that we have decided to name - the Greatest Volcano that we have ever climbed. Slowly we walked, and now we can appreciate the beautiful sight that we have missed, as we, the day before, tried to reach the camp before the last light. The return journey, with the lake on the left. On hind sight, for such a mountain, we should have given more time, but we were trying to take advantage of the long weekend, and everything was done within 5 days. After the climb, we were attempted Gunung Bromo on a 4 by 4, to view the sunrise. This was one whirlwind climb; and for our record - Semeru surpassed Rinjani on the toughness scale. haii. are you a professional climber? I plan to hike this mountain. but afraid to climb the loose sands before reaching the top. how do you manage climb it?is there any safety rope? Foremost, thanks for visiting my blog. No, I am not a professional climber, just that my friend and I love to go trekking. The trick to climb Semeru, is actually to do it fast, meaning that your steps must be one continuous action, the moment you stop, you will have a tendency to slide down (this is the same as in walking on mud). 2 of our climbers have to rely on rope, but being anchor by someone who has already climbed to a higher elevation, and this can be the local guide/porter, or one of your fitter friend. I was stuck for 1 hour in the same spot, till I gave my last burst of energy, and basically aimed for certain point higher up, and just scrambled up. So strong leg muscles are required. If you have snow ski pole (with the bigger umbrella), it will help too. hye..im from malaysia. i just watched a movie called 5cm. it was indonesian movie. the scene was at the gunung semeru. cantik betul!! i was so excited! realllllyyy beautiful! for a teenagers like me? do i capable to climb it? i just want to know, for a teenagers like me, do i capble to climb it? Thanks Falwan for the complement. Regarding your question, it is difficult to gauge without knowing your fitness level, assuming that you jog and walk regularly, and more so you are young, you should have less of a problem going up. 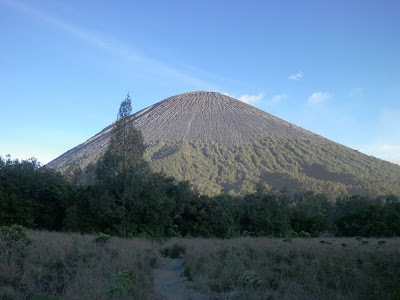 As mentioned in my blog, Semeru being a volcano, the side is covered with loose substrate, and especially the part that is nearer to the summit is of steeper gradient with no vegetation for support, therefore it will become more of a situation of mind over body, as there will be many situations that you might want to give up the climb. If you are not a purist (no help from other party other than your own power), the guide might use rope to assist in your climb. At least 2 of my members did just that. The reward of climbing and reaching a summit, is more of a humbling satisfaction that I have achieved, and not as a bragging right. Nobody can conquer a mountain! But rather by Grace of God, that we did it. Hi, great article on Semeru! I came across your blog in my research and was wondering if you could share the contacts of the guide you used? as Im hoping to find a reliable guide to bring me up the mountain. Thanks! Hi, I came across your blog in my research on Semeru and was wondering if you could share your contacts for a reliable guide? Thanks! Let me get back to you once I am back home. Now in Nepal doing the ABC route. We are back from the ABC trek. Can you give me your email address, I can send you our contact info. For us we chose a local contact. For our trip, we engaged through a Singapore travel agency. And the local travel agency service was not up to par! Suggest that you search the internet for alternative travel agency, as I don't wish you to have bad experience like what happened to us. Your blog really motivate me to climb to the TOP! Im Indonesian, live in East Java for 30 years and yet didnt know this beautiful mountain exist. Thanks, since I got so motivated, I will stop smoking and do jogging. Your blog made a good impact. Will go early May 2016.